You've developed a solid overview of a company's financial statements,how to read an income statement, and how to separate a strong balance sheet from a weak one. 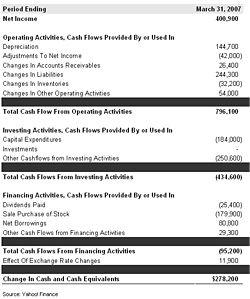 Now, let's take a look at the statement of cash flows. There's a lot that can be gleaned about a company's finances from the cash flow statement if you know how to properly analyze it. Let's examine how the statement of cash flows is constructed, what can be derived from reading and analyzing it and how it relates to the way a company manages its liquidity and cash needs. A company's statement of cash flows creates a bridge -- or reconciliation -- between a company's cash balances from one accounting period to another. The statement of cash flows is important to investors because it provides insight into how a company generates and expends cash, and ultimately, its ability to return value to shareholders. This is the best place to start, because theoretically, if all that you did was run a cash business without having to capitalize certain assets or utilize liabilities, then net income would be your cash flow. 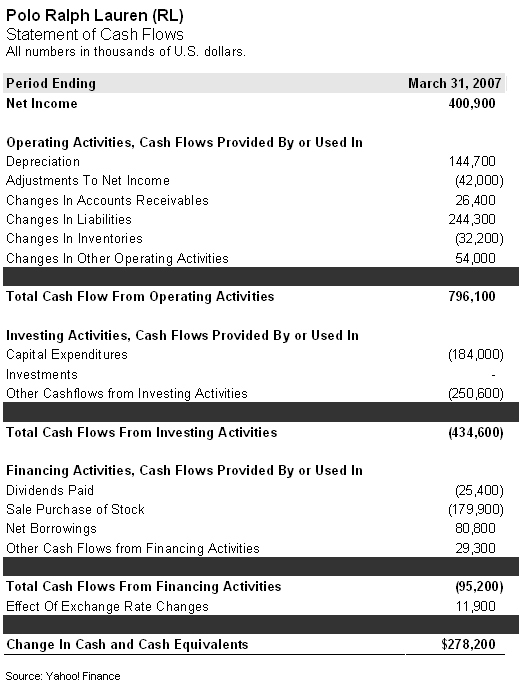 Because net income is not the sole driver of cash flows, we have to make some adjustments (see 2, 3 and 4). According to the Ralph Lauren Corp. income statement from the same year, the company generated gross profits of $2.336 billion and operating income of $652.6 million during the same period. After subtracting nonoperational expenses such as interest expense and taxes, Ralph Lauren Corp. earned net income of $400.9 million. In this part of the statement of cash flows, we either add or subtract the impact of two types of activities: noncash income statement items and changes in operating assets and liabilities. Non-cash income statement items are those P&L (profit and loss) items that are GAAP (generally accepted accounting practices) accounting in nature but are not accompanied by a cash receipt or disbursement. Examples of these non-cash items are depreciation, amortization, bad-debt expense, stock- based compensation and foreign-currency gains/losses. Changes in operating assets and liabilities are also adjusted for, because they represent the conversion of assets or liabilities to cash flows derived from income items in a prior reporting period. For example, Ralph Lauren incurred $144.7 million in depreciation expense during the period. Because depreciation expense is a noncash charge to net income, it must be added back to net income in determining cash flows. Furthermore, Ralph Lauren turned $26.4 million of accounts receivables into cash during the period. Because these receivables were for net income earned in a prior period, we need to add that to our cash-flow statement. Investments are when a company purchases or takes a strategic stake in another product, business or company. Operational cash flows are generated from the daily activities of selling goods and services, which are included in net income. Because investment activity is not an operational transaction, we must adjust for cash flows related to investments. Investments made and capital expenditures ("capex") are accounted for as reductions to cash flows. Sales of investments will be reflected as positive cash flows. Companies will issue debt or stock to raise cash. This will be a source of funds. Debt retirement and stock repurchases will be a reduction to cash. Other capital transactions such as hedges or swaps may also be accounted for in this section. Furthermore, the payment of dividends will be reflected in this section. For example, Ralph Lauren Corp. paid out $25.4 million in dividends and repurchased $179.9 million of stock as part of its plan to return value to shareholders. In order to fund recent acquisitions of its partnership share in certain joint ventures, Ralph Lauren Corp. borrowed $80.8 million. The extent to which the company's operations -- both current and past -- have contributed to cash flow. It is not only important for a company to earn economic value for its shareholders -- it must convert that to cash or hard assets. How much the company is investing in its own business by way of capex or to expand its business through strategic acquisitions and investments. Ralph Lauren Corp. has managed to not only earn money from operations; it converted prior earnings to cash and then used that for future investment in operations. The extent to which the company has been successful in returning value to shareholders or has had to tap the capital markets in order to fund its operations and investing activities. Companies with high cash balances and low levels of debt are ideal for those looking for new investments. The statement of cash flows will highlight how successful a company has been in its efforts to generate cash and reduce debt. A good company will seek to generate positive free cash flow. Free cash flow is the cash that a company has available for distribution to shareholders after payment of all its financing obligations. Despite borrowing $80.8 million and returning nearly $200 million to shareholders, Ralph Lauren Corp. still generated $278.2 million in cash that fiscal year. Another way to look at it is that nearly half of the cash provided from Ralph Lauren Corp.'s operations was returned to shareholders. If you were to look at Ralph Lauren Corp.'s balance sheet that year, you would also notice that while its debt levels have risen, so has the company's amount of cash and equivalents. How Does Cash Flow Relate to Liquidity? The goal of a company -- besides creating free cash flow -- is to ensure that it has sufficient liquidity to meet its financial obligations and grow its business. Thus, from time to time, a company will have to access the banking or capital markets in order to increase its liquidity beyond the sources of its current operations or assets. There are three basic ways in which a company can create liquidity beyond its operations or assets: Monetization of assets, issuance of equity and issuance of debt. Let's look at all three methods. Monetization of assets can be achieved through disposal of a business, sale of a joint venture, IPO of a subsidiary or sale of assets such as property, a plant or equipment. A good example is when McDonald's sold Boston Market to Sun Capital Partners back in 2007. The sale of common stock through a secondary offering or issuance of preferred stock. Preferred stock can be either straight preferred or convertible into common stock. Think of when Bank of America purchased a sizable convertible preferred private placement issued by Countrywide Financial to help the mortgage company during the recent liquidity crisis. Companies can issue debt. Debt comes in two main forms: secured and unsecured. Secured debt is issued against the value of an asset such as real estate, receivables or marketable securities. This may take the form of a mortgage, "repo" transaction, or asset-backed security, like when CarMax recently closed on a $500 million asset-backed loan that was collateralized with automobile inventory. An unsecured liability is created when a company borrows money against the full faith and credit of that company without pledging any collateral to the lender. As with preferred stock, unsecured debt can be straight or convertible into stock. Because secured debt grants the lender a security interest in the assets borrowed against, the rates of interest tend to be lower than that of unsecured debt. Convertible debt will have lower coupon rates than straight debt, because the holder will also benefit from the embedded option implicit in the conversion feature. For a more in-depth look at how these statements work, review statements of cash flows for several companies that you're interested in. In the process, compare and contrast the companies that are in the process of generating cash and returning value to shareholders vs. the companies that are borrowing money to maintain or expand operations. At the time of publication, Rothbort was long BAC and MCD, although positions can change at any time.